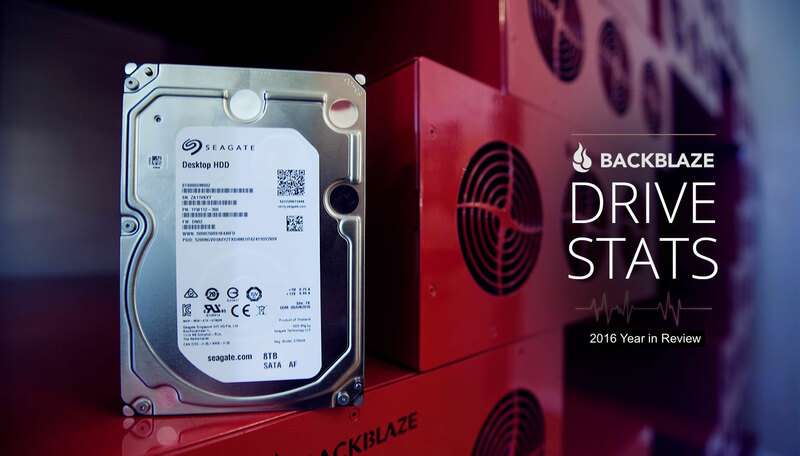 Cloud storage provider Backblaze has published Q4 2016 and full-year hard drive failure rate statistics of the 71,939 production hard drives used solely as data drives. The company maintains another 1,553 HHDs although those are reserved as boot drives and thus, not included in this analysis. Drives that are used for testing purposes and those drive models for which they do not have at least 45 of are also omitted. Looking at the 2016 full-year data, we see that three drive models – the 8TB HGST HUH728080ALE600, the 8TB Seagate ST800NM0055 and the 4TB Toshiba MD04ABA400V – ended the year with zero failures. It’s worth noting, however, that the drive count on these models is pretty low – 45, 60 and 146, respectively – and that the Seagate drives weren’t deployed until November. For the year, a total of 1,225 drives kicked the bucket which works out to 3.36 failures a day or around five per workday. The yearly drive failure rate for 2016 was just 1.95 percent, a solid improvement over the 2.47 percent that died in 2015 and far below the 6.39 percent that croaked in 2014. Backblaze also organized 2016 failure rates by drive size and vendor. Again, the data is skewed a bit due to the number of drives (or lack of) between brands but what we see is that 3TB drives are the most reliable with a failure rate of just 1.40 percent. Looking at manufacturers, HGST came out on top in 2016 with a failure rate of only 0.60 percent with Western Digital having the highest failure rate at 3.88 percent. Data diehards that want to dig in deeper should check out Backblaze’s blog post on the matter for a more detailed analysis. The company will also be presenting its “Backblaze Hard Drive Stats for 2016” webinar on February 2 should you wish to tune in.